At Christmas time, one other thing comes down out of the cupboard for its yearly visit - The Christmas crib. Of course my Christmas crib is hand knitted. 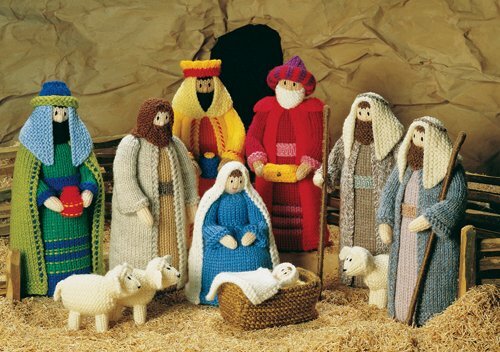 The pattern is from Jean Greenhowe's Christmas Special pictured below. The yarn is a variety of 8ply acrylic and wool from my stash and 3mm needles were used. I made the first set of Christmas crib figures not long after I got married twenty something years ago. They are getting a little bit battered up now. I was mending a few figures today: just standard wear and tear, the veils come loose and arms tend to fall off. However Mary required a more substantial repair with a large hole having appeared in the middle of her skirt. I personally suspect the cat had a major disagreement with her behind my back. Oh well, just as well I can darn. While I was at it I had them pose for photos. Mary, Joseph and baby Jesus. (Mary looks surly and has a dodgy neck). "We three kings of Orient are....."
The shepherds' staffs are the one thing I am not really happy with. They are made of drinking straws. tightly wrapped with wool which is glued to the straw. However I used bendy straws and over the years the bendy bit has gone weird and now there are visible gaps in the wrapping. I think the pieces of twig I used on my sister's set (see below) look much more authentic and will be more durable. Close up of one of the King's faces. The eyes are just french knots. I did make one other modification when I making the second set. The original figures have bases which are made of two layers of cardboard. The years have not been kind to these. They have softened and warped over the years and I can't replace them as they go into the figures before you stuff them. Consequently a few of my figures stand a little drunkenly at times. So the new ones have bases made out of the lids of ice-cream containers. Hopefully the plastic will stand up to things much better. This year Naomi's crib is set up on the top of the wall unit as her dog thinks all stuffed animals exist solely to be chewed on. The completed baby Jesus in his manger. I much prefer the twigs as staffs. They are glued on with hot glue. This one is fondly referred to as the gay shepherd. He is overly fond of pink. There is a Christmas crib which goes with both of these. Mine is beautifully made, scale model of our gazebo completely made from a gorgeous red pine. However, one of the supporting pillars is loose and it is in the shed waiting for repairs. The boys made Naomi a little wooden shed for hers. However, the figures are taller than the overhanging porch and they don't really fit. So back to the drawing board. Hola Jo-Ann, soy Adriana desde Argentina, quiero felicitarte, el pesebre te quedó precioso. Yo desde aquí no puedo comprar la revista, y no la tienen en formato digital, asi que tendré que copiarla, e inventarme los patrones, tus fotos será de gran ayuda, cuando tenga alguno terminado te muestro las fotos. Does anyone know how I can buy a copy of this nativity pattern. I have tried everywhere but can't find it. I would prefer it downloadable because I am in the US and I believe it comes out of the UK and many times dealers won't deliver to the us. Much appreciated.